The largest fossil mounts on display at the National Museum of Natural History are, naturally, the sauropods. Together, the iconic Diplodocus (USNM 10865) and its somewhat understated companion Camarasaurus (USNM 13786) represent some of the most incredible animals the world has ever known. This post is about the history of these specimens: where they came from, who put them together, and what they’ve taught us (and continued to teach us) about prehistory. In 1909, a fossil prospecting team led by Earl Douglass of the Carnegie Museum of Natural History hit the jackpot north of Jensen, Utah. At the site now known as Dinosaur National Monument, Carnegie Museum teams excavated over 300 tons of Jurassic fossils over 13 field seasons. The immensely productive Carnegie quarry is thought to represent a prehistoric river bar, where dead animals were washed in during a seasonal flood. In addition to an assortment of crocodiles and other small reptiles, this location has yielded remains of Apatosaurus, Diplodocus, Stegosaurus, Allosaurus and many other dinosaurs. Although the site was far from exhausted, the Carnegie team moved on in 1922, at which point Smithsonian paleontologist Charles Gilmore took over. Gilmore led the first USNM field season at the Carnegie quarry in May of 1923. In their final year at the site, the Carnegie team had located two partial sauropod skeletons. Gilmore opted to focus on excavating these “in order to secure a mountable skeleton” for display (Gilmore 1932). Once the excavation began, Gilmore decided that the Diplodocus skeleton dubbed specimen 355 was the best candidate for a mount. The skeleton consisted of an articulated vertebral column (from the 15th cervical to the 5th caudal), a separated but nearly complete tail, the pelvis, both pectoral girdles, much of the rib cage, both humeri, and a complete left hind limb. Unfortunately, the head and most of the neck had eroded out of the hillside and long since weathered away. Some elements not preserved with specimen 355 were reportedly cherry-picked from another specimen at the same site. This sort of selective excavation is discouraged today, but was typical at the time. On August 8, the team wrapped up and shipped 25 tons of material back to Washington, DC via railway. 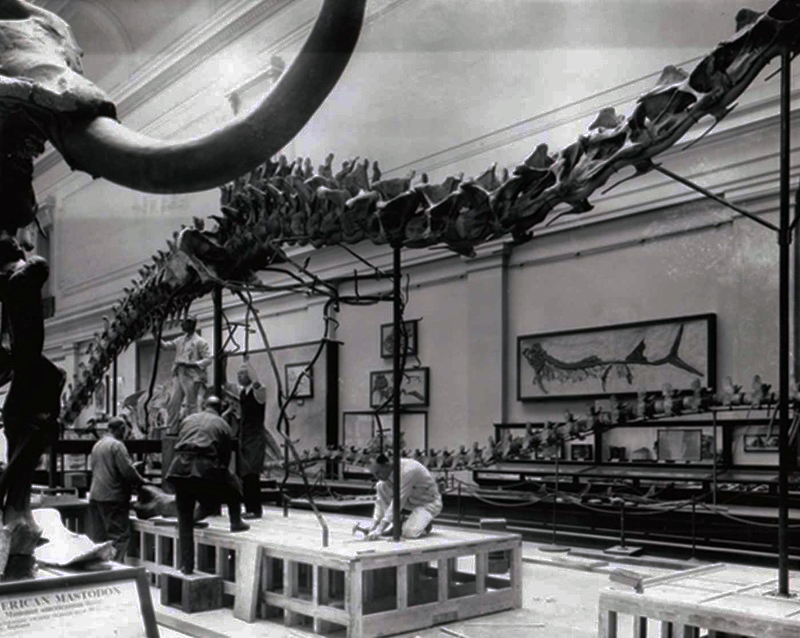 Preparing and mounting the Diplodocus was, according to Gilmore, the single most ambitious undertaking attempted by the department during his tenure. In his words, “the magnitude of the task, by a small force, of preparing one of these huge skeletons for public exhibition can be fully appreciated only by those who have passed through such an experience” (Gilmore 1932). Gilmore, along with preparators Norman Boss, Thomas Horne, and John Barrett, spent 2,545 working days over the course of six years preparing the skeleton for exhibition. Gilmore followed the method Arthur Coggeshall had developed at CMNH over 20 years earlier for mounting their sauropod. The vertebral column was assembled first, supported by a series of steel rods. This structure was mounted at the appropriate height on four upright steel beams securely anchored to the floor. Limbs and other extremities were subsequently added, with steel rods shaped to the contours of the fossils supporting each portion of the skeleton. Missing parts of the skeleton, including the right hindlimb and the distal portions of the forelimbs, were filled in using casts of the Carnegie Diplodocus. These casted elements were colored “to harmonize with the actual bones but with sufficient difference to be at once distinguished from the originals” (Gilmore 1932). This is noteworthy, because the creators of other dinosaur mounts at that time had been known to deliberately disguise artificial elements by painting them to match the fossils. Although the Smithsonian Diplodocus was a composite of multiple specimens and therefore does not represent any single animal that actually existed, the decision to make the replica bones readily visible represents a degree of integrity that is more common in modern museum displays than it was in Gilmore’s time. In the process of preparing and mounting the Diplodocus (at this point designated USNM 10865), Gilmore was able to further refine our understanding of sauropod physiology. Looking at the specimen, Gilmore was easily able to dismiss notions by earlier workers that Diplodocus had sprawled like a crocodile, asserting that “the crocodilian attitude for Diplodocus involves anatomical impossibilities” (Gilmore 1932). Additionally, since the entire dorsal portion of the vertebral column was present and intact, Gilmore determined that the presacral vertebrae (in the lower back) arch downward, toward the sacrum. 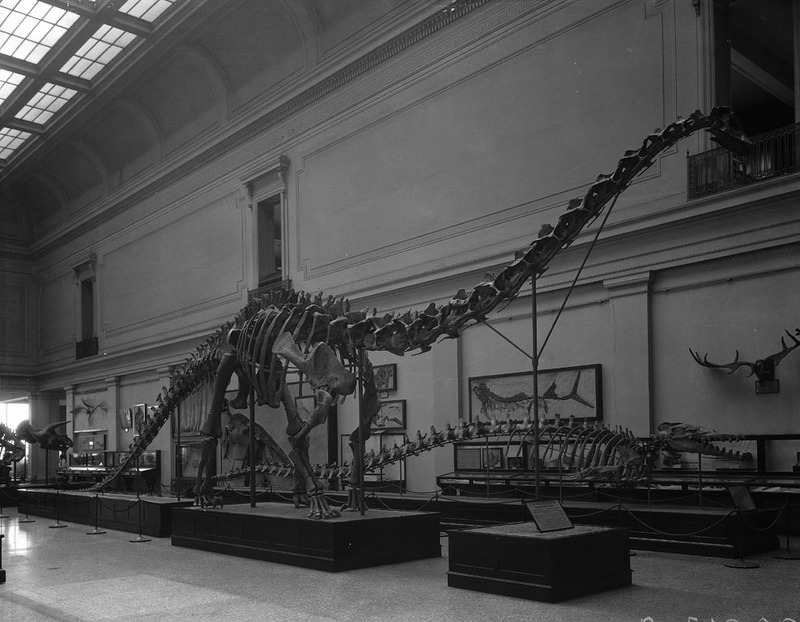 The Carnegie Diplodocus and American Museum of Natural History Apatosaurus had been mounted with completely straight backs, so Gilmore was able to create a more accurate mount. Studying the articulated vertebral column also convinced Gilmore to raise the tail higher than in previous sauropod mounts. Although it would be decades before paleontologists started raising the tail completely clear of the ground, this was certainly a step in the right direction. Gilmore refrained, however, from definitively assigning USNM 10865 to a particular species of Diplodocus, since at the time (and to this day, apparently) the differences among the named species of this genus were unclear. The completed Diplodocus skeleton was 70 feet, 2 inches long and 12 feet, five inches tall at the hips, making it about 14 feet shorter in length than its Carnegie Museum predecessor. The mount was introduced to the Hall of Extinct Monsters at the United States National Museum in 1931, positioned atop three pedestals so that visitors could walk right underneath it. The Diplodocus was placed right in the center of the gallery, facing west so that it could stare down visitors as they entered the hall. The Smithsonian acquired its second Dinosaur National Monument sauropod in 1935. 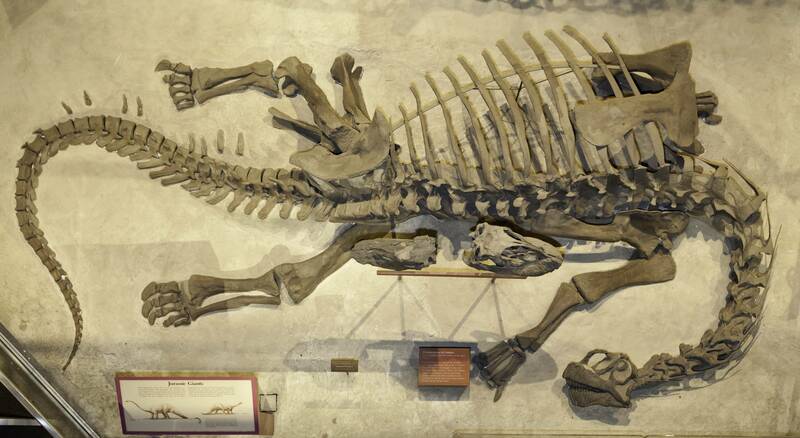 Rather than excavating the specimen themselves, the Division of Vertebrate Paleontology acquired the skeleton in a trade with the Carnegie Museum. Earl Douglass had found the Camarasaurus sometime before 1922, but it had never been prepared and was in fact still sealed in its original plaster jackets. 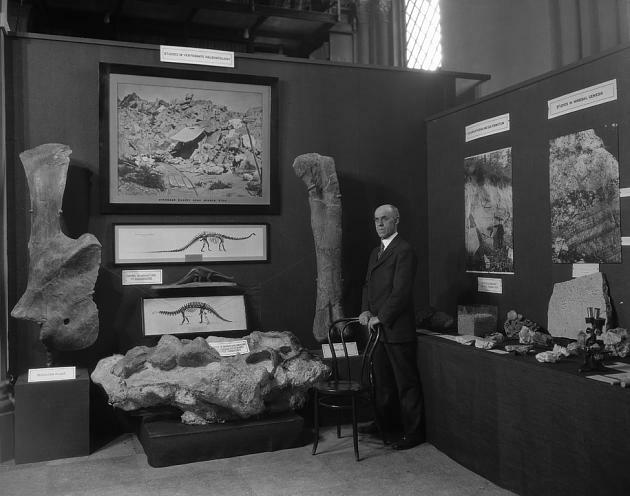 Ray Bassler, Head Curator of the USNM Department of Geology, arranged the deal with the Carnegie Museum. In return for the five unprepared field jackets containing the sauropod, Pittsburgh got a skeleton and eight skulls of Equus simplicidens (a Pliocene horse from Idaho, of which the USNM had dozens), plus five months of Gilmore’s time and $1720 to make up the difference. The Camarasaurus made its first appearance at the 1936 Texas Centennial Exposition in Dallas. Norman Boss and his assistant Gilbert Stucker prepared the specimen in full view of the public. Live fossil prep is common in museums today, but the Texas Centennial Exposition is one of the first known examples of such a display. A new 15×8′ oil painting of Camarasaurus by R.B. Horsfall served as a backdrop, and smaller specimens, including mammoth teeth, rounded out the temporary exhibit. After the Exposition, the painting would be used in the Hall of Extinct Monsters until the 1963 renovation. 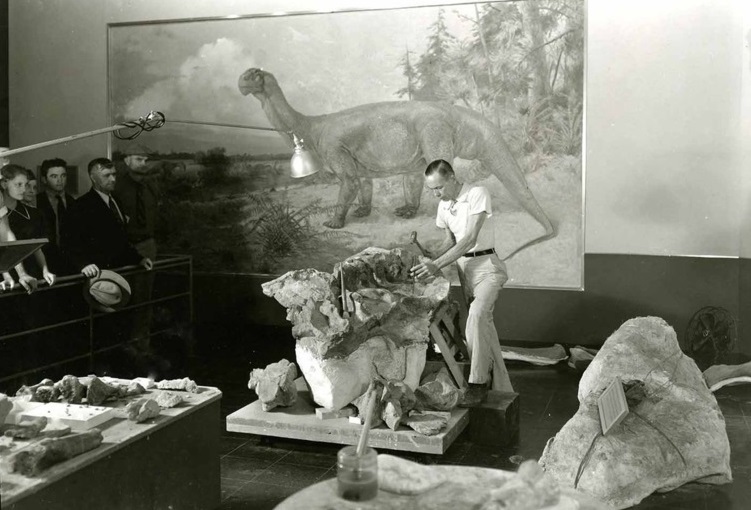 Norman Boss prepares the Camarasaurus sacrum at the Texas Centennial Exposition. Photo courtesy of the Smithsonian Institution Archives. The Camarasaurus in its death pose at NMNH. Photo by the NMNH Department of Paleobiology. As Boss and Stucker prepared the fossils, it became clear that they had the second most complete Camarasaurus ever found, with virtually all bones represented from the skull to the base of the tail. Only the juvenile Camarasaurus on display at the Carnegie Museum is more complete. In 1937, the Greater Texas and Pan-American Exposition contributed $950 for the Smithsonian to purchase an unprepared Camarasaurus tail (also from Dinosaur National Monument) from the Carnegie Museum. It was shipped directly to Dallas on June 7th, just in time for the Exposition’s second summer. Back at the museum, the composite Camarasaurus was installed in 1947. It was assembled in a death pose, mirroring the position in which the fossils were found in Utah. Unfortunately, this lowered the specimen’s profile somewhat. 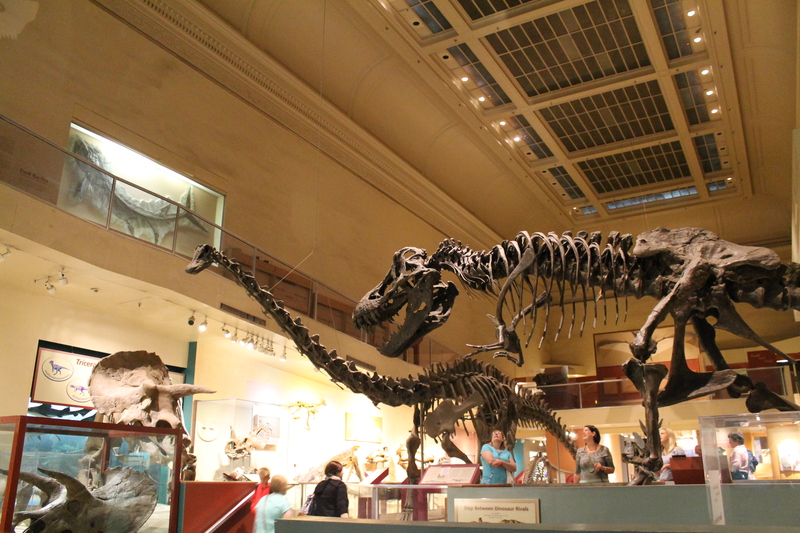 Although the Camarasaurus is one of the largest dinosaurs in the NMNH collection, the death pose has meant that it has never had much of a presence. The Diplodocus was not moved during the 1963 modernization of the fossil exhibits, but the walkable area around the mount was significantly reduced. Visitors could no longer walk under the skeleton, or get as close to it. The Diplodocus was not moved during the 1981 renovation, either, but the neck support coming up from the floor was replaced by less intrusive cables suspended from the ceiling. The prone Camarasaurus remained by its side, first to the right of the standing sauropod, and then to its left. 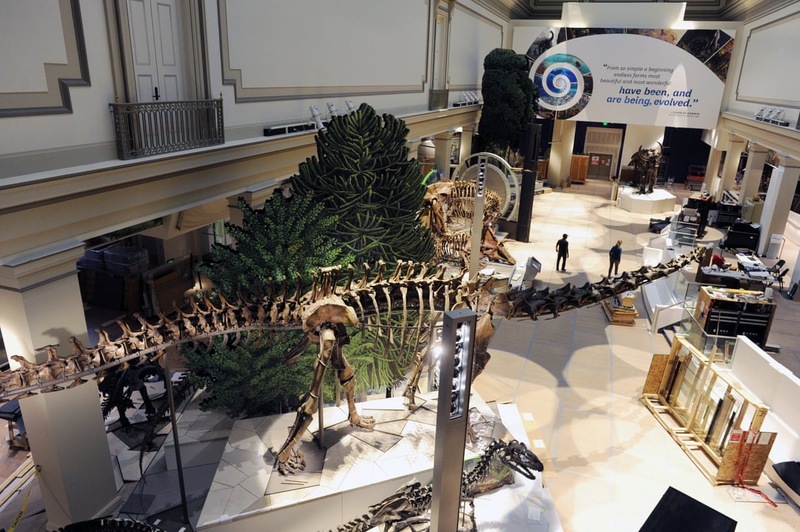 Diplodocus as it stood from 1981 to 2014. Photo by the author. The Diplodocus remained in place and unmodified for more than 80 years. Generations of visitors have gazed up at it, and those lucky enough to view it before 1963 were able to walk under it. This mount has unquestionably taken on a second life: it is an institutional and regional icon as much as it is a dinosaur that once roamed a Jurassic floodplain. And in three days, NMNH collections staff and specialists from Research Casting International cleared every trace of it – well over 200 individual bones – from the hall. A high angle on the remounted Diplodocus. Jocelyn Augustino for the Guardian. Of course, the now-disarticulated Diplodocus fossils are in the best possible hands. The team at RCI will conserve, restore, and eventually remount them in a modern, dynamic pose. Expect to see the Diplodocus at the center of the Jurassic platform, facing north, with its tail aloft and its head swinging gracefully to the left. Perhaps even more exciting is the new pose for Camarasaurus. It will be standing on its feet for the first time in 150 million years, finally earning its rightful place as one of the most spectacular fossils in the Smithsonian collection. Gilmore, C.W. 1932. On a Newly Mounted Skeleton of Diplodocus in the United States National Museum. Proceedings of the United States National Museum 81:1-21. Gilmore, C.W. 1941. A History of the Division of Vertebrate Paleontology in the United States National Museum.” Proceedings of the United States National Museum 90.